Plans to turn the shrine-like spot into a memorial to repression marks the end of an era in Gori, Stalin’s birthplace. Since Joseph Stalin’s death in 1953, statues of the Soviet dictator have been toppled, portraits removed and history books rewritten. But in Gori, Georgia, the leader’s hometown, one tribute remains wholly intact: the Stalin Museum, where thousands of tourists flock each year to step inside the leader’s childhood home, see his trademark boots and buy his favorite wine. But not for much longer: the Georgian Ministry of Culture has recently announced plans to transform the celebratory museum into an account of Stalin’s repressions. Stalin notebooks: Internet meme, or provocation? The ministry envisions the museum’s transformation into a comprehensive look at Stalinism along the lines of Washington’s Holocaust Museum, designed by “internationally recognized names in the field.” Kandelaki says the multi-million dollar project, which will receive both public and private funding, could be completed as soon as next year. Stalin was born Iosif Dzhugashvili in 1878 in Gori, a town an hour west of Tbilisi. The museum dates from 1937, the height of Stalin’s purges. Tasked with turning Stalin’s childhood home into a monument to the all-powerful leader, secret police head Lavrenty Beria erected an elaborate Greco-Roman pavilion around the humble two-room house. The mammoth main building behind it was completed in 1956, in similarly opulent style. President Mikheil Sakaashvili’s government champions de-Stalinization as key to creating a democratic, independent Georgia, reclaiming the mantle of the short-lived Georgian republic ended by Bolshevik invasion in 1921. “There is a great thirst for reassessing and realizing the extent of the damage that was brought on Georgia by [Stalin], by the system that he brought to this country which was foreign to us,” Kandelaki said. But for many in Gori, Stalin’s legacy is more complicated. Today, the museum looks much as it has since the ‘70s, when the current exhibition was put in place. Inside, a sweeping marble staircase leads up to a landing graced by a bust and oil paintings of Stalin. A gift shop sells collections of his poetry and wine with his portrait on the label (his reported favorite, semi-sweet Kindzmarauli). Young female guides recite a lecture about the dictator’s life as they lead foreign tourists past walls of photos and documents. The story begins with Stalin’s childhood Romantic poetry, building to his revolutionary exploits, and then skips abruptly to World War II, when he became the Generalissimo, vanquisher of fascism. A “hall of gifts” presents hundreds of trinkets Stalin received for his seventieth birthday, like a portrait made of tobacco leaves presented from Romania. The progression culminates in a dark oval room, in the center of which lies Stalin’s death mask. Visitors snap a photo and quickly move on. After a peek into the Generalissimo’s Kremlin office, complete with his familiar overcoat, boats and pipe, the tour continues outside to see his childhood home and the train car he traveled in to the Yalta Conference. The only direct mention of Stalin’s crimes comes in a small “room of repression” added four years ago. Simple printouts describe Khrushchev’s ‘secret speech,’ alongside several pictures of repressed local families. But its primary focus is photographs of the bombing of Gori by Russian planes during the South Ossetian conflict in 2008. In its new incarnation, the museum will cover topics like the collectivization of farms, the Great Terror and the invasion of Georgia, which Stalin himself spearheaded. “Now it will show not just how he lived, but also what sort of horrors there were,” Kalandadze said. The old exhibition, meanwhile, will be preserved as an artifact. Kalandadze says the museum has not received any direct complaints from the community about the upcoming changes. But Stalin still enjoys local popularity, particularly among the older generation. On December 21, his birthday, aging fans still gather outside the museum, though in recent years their numbers have dwindled from thousands to a few dozen. Most locals’ feelings towards the museum overhaul are a mixture of relief and apathy. 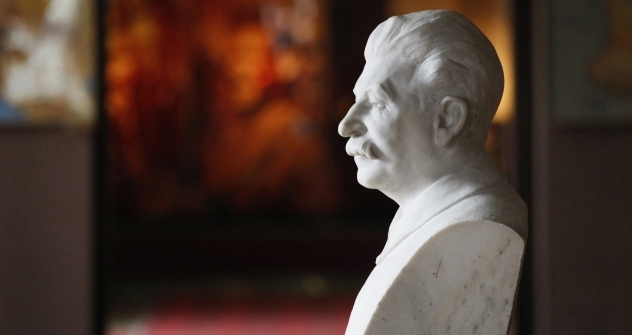 For Gori’s current schoolchildren, Stalin’s meaning is up in the air.